As so many of our friends are constantly on orkut, sending scraps, commenting on photos, and bumping hips on BuddyPoke, we figured it was time to make it easy for you to chat directly with your orkut friends whenever they come online. 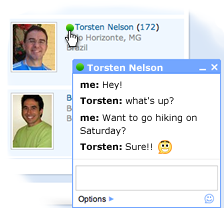 That's why we are excited to announce a fully integrated version of Google Talk that works seamlessly from within orkut, with no install or separate window required. I'm sure many of you (especially you social butterflies with hundreds of orkut friends), are concerned about being bombarded with chat requests every time you go online. Not to worry! To get you started, we've come up with a formula that automatically predicts which of your orkut friends you probably want to chat with, and only tells those people that you're signed into Google Talk. Our formula takes a bunch of things into consideration, giving preference to people who you've labeled as 'best friends' or written scraps to recently, and people who have friends in common with you. If you already use Google Talk, either on its own or as part of Gmail, then your friends signed into Google Talk in other applications will also be able to chat with you when you come online.